Wooden crates are built to resist punishment. This makes them challenging, if not impossible to open without tearing them to pieces. Using the right tools can make all the difference. Most home shops have tools around that will open a crate, but there are specialty tools that make the job faster and easier, without much collateral damage. 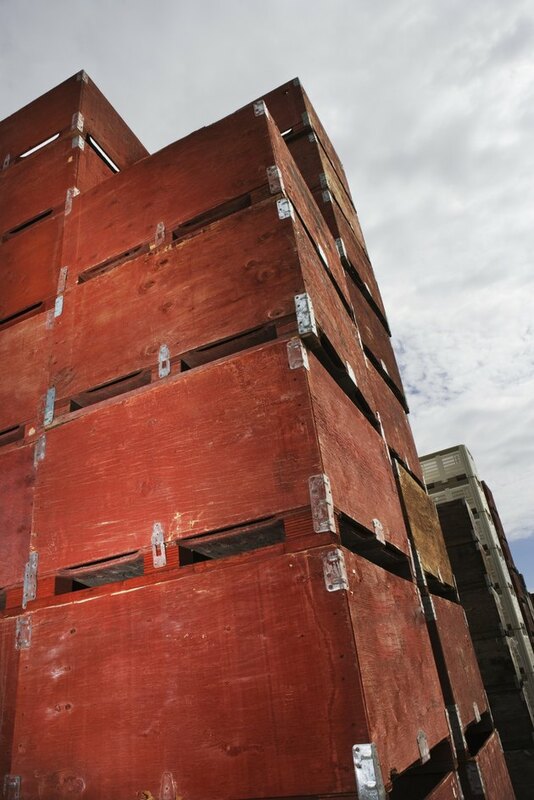 Crates may be assembled with special nails that resist pulling out. A cat's paw is a short crowbarlike tool designed specifically for removing nails. It gets its name from the cupped end that has a sharp notch with two ears -- the "paw." Place the paw behind a nail head, and use a hammer to drive the paw into the wood until the notch hooks onto the nail. Apply downward force to the other end of the bar to pry up the nail. Standard crowbars work in the same manner but not as surgically as a cat's paw. The impact nail puller pulls out nails that are deeply embedded into the wood. It has similar function as the cat's paw, but uses a set of pincers at the end like you would see on an insect. Position the pincers over the nail head. On the back of the handle there is a sliding weight. Pull up, then slam down the sliding weight, driving the pincers into the wood under the nail head. There is a small curved hook above the pincers. It swings down and hooks into the wood. Force the handle of the nail puller downward. The curved hook acts as a fulcrum, prying the nail out of the wood. Diagonal pliers are the most widely recognized of all crate opening tools. You can use them to extract nails that have broken off, sometimes requiring digging down into the wood to grasp the nail shank. The pliers have a slight bend to them for prying. If the nail refuses to come out with a prying motion, bend the nail back and forth until it gets warm and breaks off. Fencing pliers are similar to diagonal pliers but are larger and have a broad curving arc at the top. The pincers are bent 90 degrees and come together perpendicular to the nail. With the broad curve and longer handles, the prying action is formidable. When all else fails you can use a circular saw to open a crate with ease. Often nails are so deeply embedded that they cannot be removed. By using a circular saw to cut through solid-wood framing and plywood at strategic locations, the crate will drop open without having to remove the nails. These saws easily cut through nails, especially with a carbide-tipped blade, but this often throws sparks and sharp, hot metal shrapnel, so always wear safety goggles when cutting near nails. Sometimes crate lids are screwed on to facilitate opening. When opening crates like these, a simple cordless drill is all you need to unscrew any or all screws holding the top or sides on. No crate opening would be complete without a hammer to bash plywood free from framing when you cannot reach the nails or screws. The hammer also aids the cat's paw and crowbar to penetrate underneath wood seams. A handheld wood saw is also good for cutting between joints, or anywhere the plywood will not separate from the wood frame. What Are Pliers Used For? What Are the Uses of the Claw Hammer?